To understand the current social movements and protest culture in Japan, it is necessary to understand the role played by the mass and alternative media. In the wake of the 3.11 earthquake/tsunami/nuclear disasters, a sense that the mass media had failed to accurately report on the nuclear contamination at Fukushima galvanized a group of individuals to form organizations whose mandate was to facilitate direct access to news information, and to train citizens in media production (Iwakami et al. 2012; Uesugi 2012). Following 18 months of fieldwork in the offices of a few such organizations, I seek here to provide a general introduction to them and their efforts to fight censorship, such as the Japanese State Secrets Act, and to address the overall culture of journalistic self-restraint, identified by many of the journalists with whom I worked as the most significant problem of post-3.11 Japan. The Free Press Association of Japan (Jiyū hōdō kyōkai) was not the sole brainchild of anti-press club activist Uesugi Takashi, (notorious for his copious publishing and indefatigable attacks on the system), but he was by far its most prominent member. Fighting the press club (kisha kurabu) system in Japan was his passion prior to 2011, when it was far more difficult to mobilize support. Journalism in Japan departs from an idealized Western model in several ways, the first being a lack of formal training in academic institutions. Japanese journalists, who often lack a public profile due to an absence of story-bylines, learn their trade and acquire journalistic habitus through experience. Second, the kisha club system encourages a collective self-censorship by locating reporters in government or corporate offices and making them beholden to official sources for news information. Not surprisingly, there are kisha club locations in the Japan Atomic Energy Headquarters and Tokyo Electric, the company that ran the Fukushima Daiichi nuclear power plant. Regardless of newspaper affiliation, reporters limit themselves to collectively agreed-upon stories intended not to offend their official sources. These structural facts in part explain why the reporting on Fukushima was so limited. In contrast, what made the Free Press Association most interesting was their insistence that press conferences should be open and accessible to anyone with an internet connection. The organization partnered with and rented their press conference space from Dwango, the company responsible for Nico Nico Douga, a site/service that, after an awkward beginning as an aggregator of YouTube videos, was relaunched as a service primarily for broadcasting original video content. 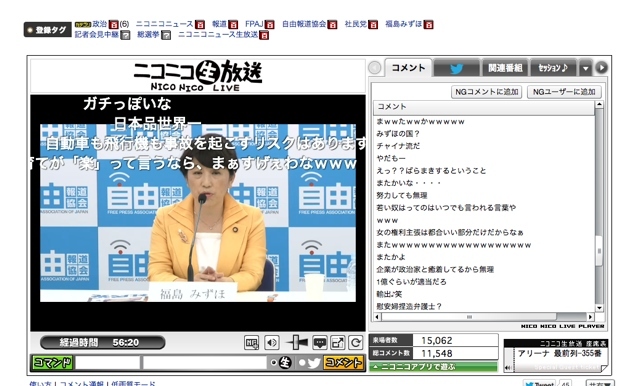 The defining feature of Nico Nico Douga is its signature in-the-moment commenting system that incorporates user feedback streaming on the video feed itself. In essence, as individuals view videos and type comments, those comments appear overlaid directly atop the video streams themselves. In the case of Free Press Association press conferences, this meant that while prominent politicians spoke, the anonymous reactions of audiences became an intrinsic part of the record. Anonymity gave viewers the courage to post satirical, even risqué commentary. Unlike comments posted beneath an online news article or video clip, as one commonly sees on below a YouTube clips, for example, one could not watch the press conference without consuming audience chatter. Provocatively, from time-to-time a member of the embodied audience would ask aloud a question raised by the online commentators– thus breaching the physical wall between audiences and presenters, and doubling the original breach that occurred online when comments met video directly. Despite this innovative approach to newsmaking, the Free Press Association dissolved amidst financial mismanagement, but reemerged as the online newspaper Newslog in 2013. Its hybridized social and mass media format had been at least acknowledged by the mainstream media, and informed the thinking of reform-minded producers about potential experiments in news broadcast. Moreover, it opened major politicians to questioning from those outside of the kisha clubs. While mainstream reporters were reluctant to repeat these exchanges, they circulated online freely. The Independent Web Journal similarly challenged journalistic self-censorship, and was galvanized by the 2011 disasters to formulate a service that would relay unedited press conferences, protests, and other events via Ustream. Though knowing little about the technical aspects of internet broadcast, and with an initial staff of two, founder Iwakami Yasumi ultimately established a network of reporters across Japan who were willing to attend relevant events, largely pertaining to nuclear energy and public health. In order to disseminate footage of events the mainstream media would not cover, the Independent Web Journal pushed forward, managing to expand its offices and draw increasingly large internet audiences during my fieldwork. Self-described media activist Tsuda Daisuke seemed to function as the country’s expert on social media after 2011, appearing in a range of formats—from Nico Nico Douga to a talk show on the major broadcaster TV Asahi to various radio shows and online events. In addition to contributions made to the Independent Web Journal and Free Press Association, Tsuda threw his support behind another major independent media organization: Our Planet-TV (AwaPura). His support was based on a drive to diversify the range of voices present in the public sphere—a much contested term in Japan (Tsuda 2012). Our Planet-TV produces its own documentaries and runs video production workshops (eizō seisaku wākushoppu) with the goal of making video production accessible to all. The organization’s documentaries increased in prominence during my fieldwork. In 2014, its very critical documentary about Tokyo Electric (Tōden Terebi Kaigi: 49 Jikan no Kiroku) beat out national broadcaster NHK for the Japanese Association of Science and Technology Journalists’ (JASTJ) prize. Reconstituting the news and mass media as an open conversation has thus become a major project of the Japanese independent media. As Japan continues to fall in the Reporters Without Borders annual press freedom rankings, in part resulting from their reporting of the 3.11 crises, such efforts seem to be of increasing urgency. Their efforts continue to provoke discussion about the merits of citizen journalism and the evolving role of professional journalists globally. This is the third report of an article series on the social movements that are currently occurring in Japan. Elizabeth Rodwell is a recent PhD graduate of Rice University’s Department of Anthropology. She is interested in image/narrative and the transformation of journalism in Japan.